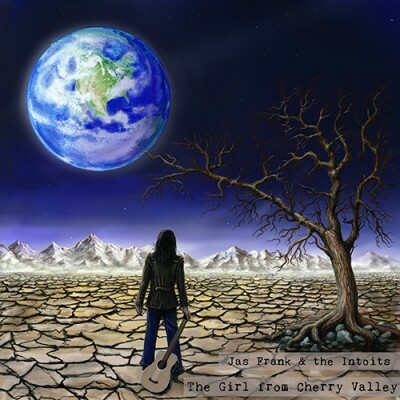 The Girl From Cherry Valley is an album from Croatian based musical outfit, Jas Frank and the Intoits. The music is avant garde and eclectic, drawing inspiration from a variety of styles and bands from various genres. Some songs on this album like In a Hole and When the Rain Stops have a harder rock quality, with powerful guitars and a very assertive energy. These bring to life an unexpected versatility as the first few tracks had a kind of dance oriented / alternative synthpop aesthetic (especially the opening track High in Space.) There are elements of the 60′s, 80′s, and 90′s in these recordings. Jas Frank is a charismatic vocalist, and her voice at times reminds me of Nena (of 99 Red Balloons fame) while at other moments bears an incredible resemblance to that of the members of iconic indie pop duo, Tegan and Sara. There is substantial musical variation on this album. What’s consistent though is that these songs are quirky, creative and artful. The lyrics are complex, and occasionally catchy in that “indie sodapop” kind of way, even while they manage to explore darker, more emotionally personal themes. The Girl From Cherry Valley is just a really neat little album from one of those indie bands that has a difficult to pinpoint yet familiar way of making you want to root for them.